Global political and economic events such as the sovereign debt crisis and the slowdown in recovery from the last crisis in economically sound countries have rendered the industrial metal prices directionless. However, copper and aluminium prices have increased by 5.7% and 4.7% since the beginning of the year. China, the world’s second largest economy consumes significant share of primary raw materials such as iron ore -60% (of global iron ore trade) , copper – 41 percent, aluminium – 40 percent. Demand outlook for these industrial metals can be explained by import, export and value creation activity in China. The metal is currently on an uptrend due to strong fundamentals – supply disruptions due to labor issues in some of the world’s largest copper mines, depleting stocks in LME warehouses, and potential demand supply mismatch. The following chart shows the monthly import growth of China and Copper prices. (superimposed over one another with same time base). 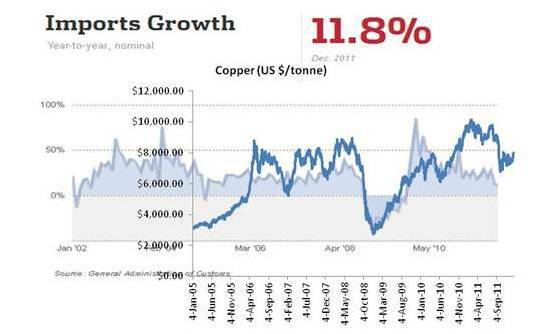 Copper prices have corrected along with the decline in import growth in China. 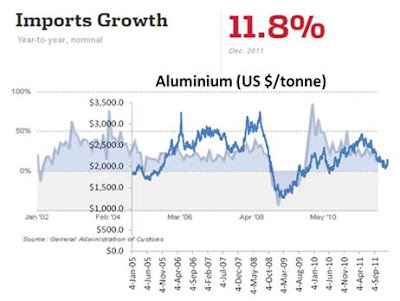 A similar trend is seen in aluminium prices during the same time period. 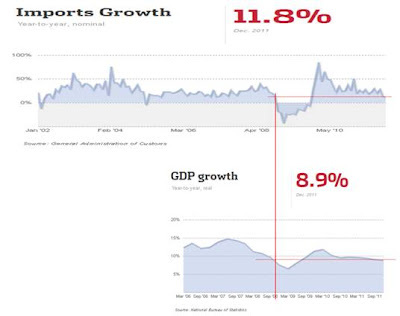 The impact of slowing imports on GDP is shown in the following chart. 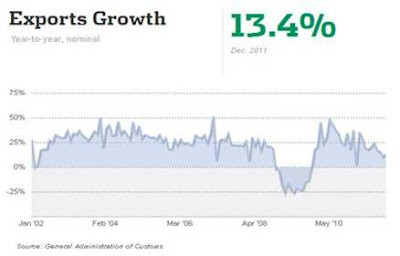 The current level of import growth and the corresponding GDP growth are exhibiting similarities to the crisis 2008-09. Another problem is the housing prices in China. Government is trying to control prices by making it difficult to finance development of luxury apartments and requiring 60% down payment from buyers. The low cost housing is not progressing as planned. These problems will likely have an impact on the GDP growth in China which has already slowed from 10.4% in 2010 to 9.2% in 2011. Further slowdown in consumption of industrial metals (lower imports) either through slower growth in EU or domestic weakening in the Chinese economy appears likely and will have an impact on metal prices especially copper and aluminium. Hence my outlook for copper and aluminium is negative. Steel consumption in India has slowed considerably from 14.5% to 2.9% in 1H12, with project offtake slowing down and other macroeconomic challenges cropping up. According to ICRA, 25 MT of new capacity are coming up in the next 18-24 months (30% of current production capacity) and keep the realizations under check despite the weakening currency scenario. The higher interest payments arising out of the capacity expansions will also decrease margins for steel makers and raise working capital requirements, thereby affecting the liquidity profile of steel companies. Companies with better capital structures such as Tata Steel will be able to withstand the competitive pressures. The major steel consuming sectors in India – construction (65%), capital goods (15%) and automobiles (8%) are witnessing slowdown. Project offtakes are affected by land acquisition issues and interest rate scenario. The near term outlook for steel is weak. India’s GDP growth rate for Q1 and Q2 FY12 was 7.7% and 6.9% while steel consumption growth for the same period was 2.9%. (Typically steel growth rate is 1.2-1.5 x GDP growth). According to GoI projections of 7.5% growth rate for India in FY12, this will be ahead of steel consumption growth. Hence the mid-term outlook for steel sector is negative. Views expressed are personal and do not constitute to the market outlook towards commodities at Unifi.